The Zerona is a specific type of non-surgical body contouring laser that allows a patient to loose inches with no surgery, no pain, and no down time. Zerona treatments for body contouring has been getting significant TV coverage on The Early Show, Dr. Oz, Good Morning America, The Doctors, and Rachael Ray to mention a few. Dr. Nelson is a firm believer in Zerona and “Erchonia”, the parent company’s non-surgical technologies. So let’s walk through the realities of Zerona treatments and what it can and can’t do for you the patient. As a board certified Plastic Surgeon with over 22 years of liposculpting experience Dr. Nelson is very familiar with current techniques for body contouring. Zerona non-surgical body contouring is a fabulous option to offer patients. Though some offices might suggest this is brand new technology it really isn’t for Dr. Nelson has been using early generations of Erchonia lasers (the company that makes the Zerona laser) for close to 10 years. Erchonia, the parent company found years ago that their lasers specific wave length when used in liposuction patients shifted fats directly out of living fat cells into the spaces around the cell where liposuction could easily evacuate it. Patients that received these laser treatments prior to liposuction had more fat removed more easily during liposuction procedures, and the patients also tended to have less bruising and less pain following the procedure. The terrific thing about the type of lasers we’re discussing here is that there is no heat, no pain, or soreness from their energy hitting your body. Tucson Plastic Surgeon, Dr. Nelson has used the Erchonia laser when performing liposuction with similar results. This led to Erchonia receiving a specific FDA approval for the use of their laser in liposuction. 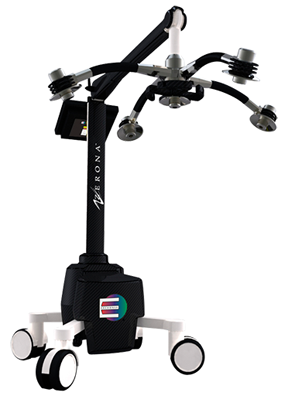 These early findings led Erchonia to place multiple laser heads onto one mounted stand so that a patient could be treated over a larger area with the laser energy, and to study how the patient’s fat distribution changed without liposuction at all; that’s correct no surgery just the laser treatment. What was found is that patients who underwent serial treatments of three treatments a week for several weeks lost inches off their waist, hips , and thighs. Repeat studies have shown similar results with size reductions of the arms or other anatomic zones when they are targeted with the laser. Original protocols were relatively strict with the use of Niacin to hasten lymphatic uptake of released fat, and also rigorous hydration to help flush the fat from the areas around the fat cells. Several reported studies have found solid results even without the vitamin supplement and as much fluid intake. One significant advantage that Zerona treatment has over conventional liposuction when treating the abdomen is that some of the fat shift may even come from intra-abdominal fat as well as fat just under the skin. A down side of Zerona compared to regular liposculpting is that liposculpting allows very precise tailoring of areas and avoidance of other zones if needed. The Zerona multihead laser spins it’s five laser beams over a broad area and can’t be quite so specifically controlled. Aggressive liposuction and liposculpting can often give a more complete result, but of course requires surgery, recovery, and down time that Zerona never has. Regular liposuction also permanently removes fat cells from an area of the body greatly reducing the number of cells in an area that can reaccumulate fat over time. The Zerona is a non-invasive laser, it doesn’t kill cells or injure them as much as modify their physiologic state so that they empty fat that then is picked up by the bodies natural mechanisms and cleared through the lymphatics. Once back in the blood stream some of this may be metabolized for energy by the body, some may be picked up by other cells of the body, but since that distribution is over all the bodies fat cells and not just a local area the net effect is significant shrinkage of the targeted areas treated by the laser. The original protocol for Zerona was a set of three treatments a week for two weeks. Some patients who only require a little correction may find that is enough for them to accomplish their goals, but Dr. Nelson most frequently finds that doing another three treatments over a third week is more likely to show solid results. While Niacin is not a key factor in Dr. Nelson’s hands it is beneficial, and good hydration at home with several large glasses of water a day over the normal baseline is worthwhile. Besides my practice is in Tucson , Arizona, and we all need to drink more water here anyhow. The key thing to remember about Zerona is it didn’t remove your fat cells like liposculpting does, it just got your cells to dump out fat from a specific body zone. Therefore for your own health, and for better long term results it’s even more important after Zerona treatments to have a good nutritional diet. If you eat fatty foods or more calories than your body needs, those cells are certainly going to be there to pick up fat in those zones again, or at least more than you would with regular liposuction where the cells have been physically removed. This is one of the reasons patients might feel disappointed with the longer term results of a Zerona treatment, use this opportunity to be better with your diet, and to motivate you to be more active and fit. Let your new shape motivate you to be healthier and more attentive to your overall well being for that’s what we all want for each other anyhow.